We have a wet, cool and windy day start to the work week with warmer, more humid air moving in on Tuesday. The steamy forecast comes as no surprise. In fact, the Northeast Regional Climate Center said the Bridgeport area had the third warmest summer on record. Bridgeport also had its second warmest August with an average of 77.9 degrees, 4.6 warmer than normal. “Meteorological summer, which encompasses the months from June through August, was noticeably warmer than usual for the Northeast,” the center said. “All major climate sites in the region recorded warmer-than-normal temperatures during this past season. Seventeen climate sites in the Northeast experienced among their ten warmest summers ever recorded, and Caribou, Maine, ranked this as their warmest summer on record. The heat wave during the first week of July, in addition to the warm temperatures throughout much of August, helped contribute to this summer being warmer than usual. The summer temperature at Sikorsky Memorial Airport in Stratford averaged 74.3 degrees - 2.1 degrees higher than normal. Hartford had it sixth warmest summer with 73.1 degreees, 1.9 degrees above normal. The hottest summer in Connecticut was in 2010 with an average of 77.9 degrees. In a tie with 1934, the summer of 2018 ranked as the fourth hottest summer on record for the contiguous United States after three months of blistering temperatures, according to the National Oceanic and Atmospheric Administration. During the meteorological summer, the average temperature for the contiguous U.S. was 73.5 degrees, 2.1 degrees above average. Monday, however, will be cool with rain and winds gusting up to 36 mph. Today: Rain. High near 66. Breezy, with an east wind 17 to 21 mph, with gusts as high as 36 mph. Chance of precipitation is 100 percent. New precipitation amounts between a half and three quarters of an inch possible. Tonight: Showers and possibly a thunderstorm. Some of the storms could produce heavy rain. Patchy fog after midnight. Temperature rising to around 68 by 2 a.m. Breezy, with a southeast wind 15 to 20 mph decreasing to 9 to 14 mph after midnight. Winds could gust as high as 30 mph. Chance of precipitation is 90 percent. New rainfall amounts between a half and three quarters of an inch possible. Tuesday: A 50 percent chance of showers and thunderstorms. Some of the storms could produce heavy rain. Patchy fog before 9am. 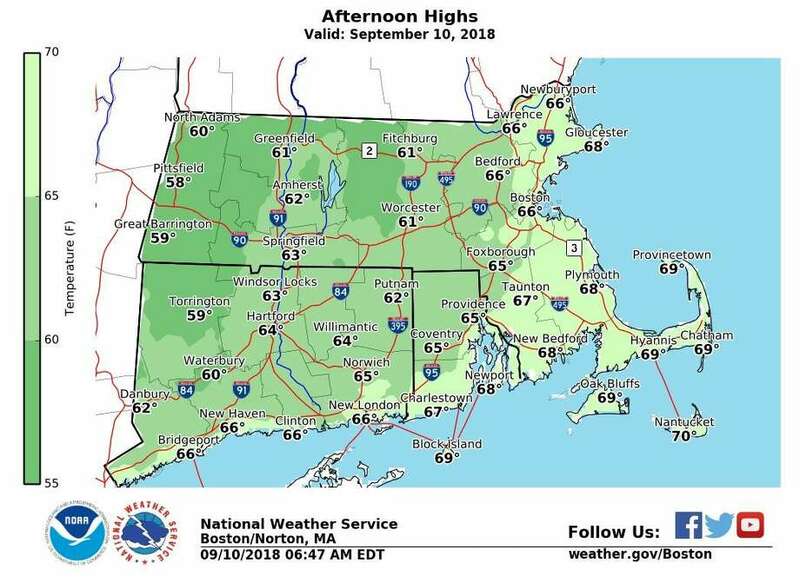 Otherwise, mostly cloudy, with a high near 80. South wind 8 to 10 mph. Tuesday Night: A 40 percent chance of showers and thunderstorms. Cloudy, with a low around 71. South wind around 6 mph becoming calm in the evening. Wednesday: A 40 percent chance of showers and thunderstorms. Mostly cloudy, with a high near 82. Northeast wind 3 to 7 mph.